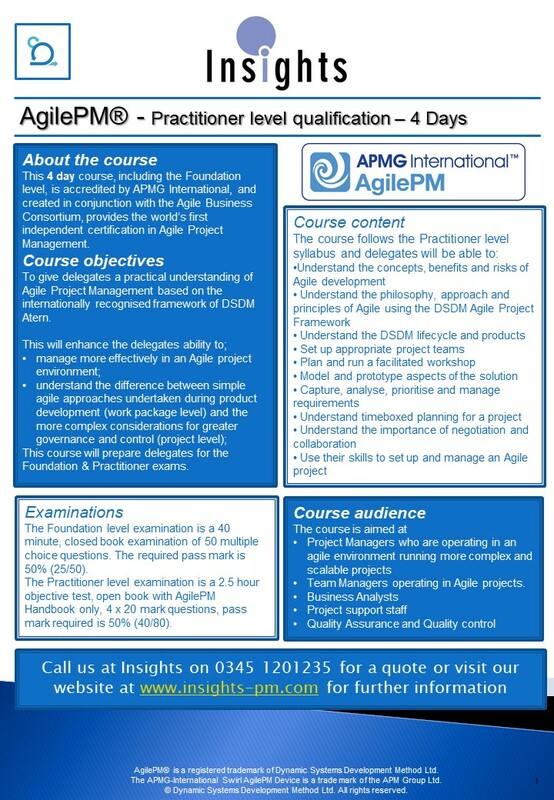 This 4-day course AgilePM Practitioner course (Includes the 2 day AgilePM Foundation course), accredited by APMG International, and created in conjunction with the Agile Business Consortium, provides the world’s first independent certification in Agile Project Management. 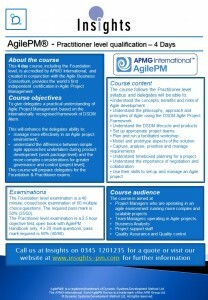 The course provides the opportunity to gain certification at Foundation & Practitioner level. Team Managers operating in Agile projects. The Foundation level examination is a 40 minute, closed book examination of 50 multiple choice questions. The required pass mark is 50% (25/50). The Practitioner level examination is a 2.5 hour objective test, open book with AgilePM Handbook only, 4 x 20 mark questions, pass mark required is 50% (40/80).